When confronted by child protesters, politicians and other adults often reach for the age-based putdown, rather than engage with the substance of whatever it is they are protesting about. Often, the suggestion is that someone older has put them up to it. Flemish environment minister Joke Schauvliege took the patronising tactic much too far when she said that recent school strikes across Belgium were a “set-up”, and that security services knew who was really “behind this movement”. On Tuesday, after Belgian security services issued a rare denial, Ms Schauvliege resigned. On Thursday, the youth-led demonstrations spread to the Netherlands, as thousands of people marched in The Hague. Similar protests are scheduled to take place across the world in the coming weeks. Ms Thunberg has said that her decision to picket the Swedish parliament in Stockholm last year was inspired by the March for our Lives gun control protests that began after the Parkland school shooting. But there are older precedents for the recent upsurge in youth activism, with children playing key roles in historic civil rights and labour struggles. School desegregation in the southern US states and the 1888 London matchgirls’ strike are two famous examples. Young people have a distinctive and valuable perspective. They deserve to be heard. Teenagers can already join British political parties, most of which grant full membership rights to mid-teens. In Scotland, 16-year-olds can vote in some elections. That should be extended to all elections across the UK. Few endorse politics professor David Runciman’s recent suggestion that the voting age should be lowered much further – to six. But many would acknowledge the sense in Scottish children’s commissioner Bruce Adamson’s criticism of the “absolutely ridiculous” double standard whereby children are held criminally responsible for their actions years before they are allowed to take part in elections. There are sensible questions to be asked about the influence exerted by parents and other adults on children professing strong opinions. But we should respect and welcome efforts by children and teenagers to make their voices heard and influence decision-making. After all, they will be living with the consequences for longer than the rest of us. Nothing throws all of this into sharper relief than the accelerating climate crisis, with figures from the UK Met Office suggesting 1.5C of warming could be reached in as little as five years. 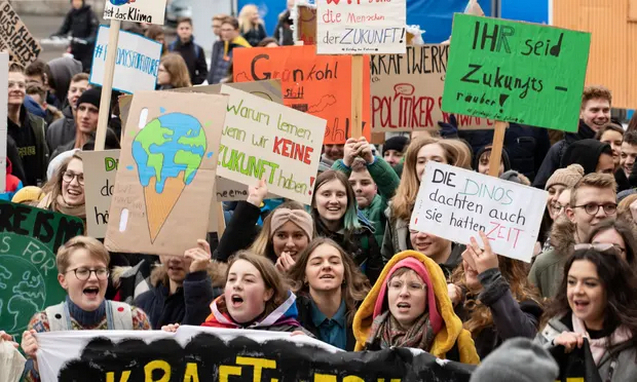 If children want to take to the streets and demand tougher action to avert disaster, who can blame them?